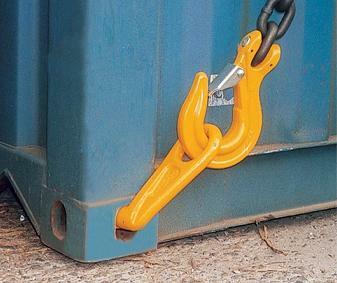 Container Lifting Lugs are designed to connect to the top, side or bottom of a shipping container for overhead crane lifting. Container lugs are supplied with an angled lug, with configurations of both left and right. Lugs can be used in either side or end apertures of bottom ISO corner box fittings to form a reliable link with sling assemblies. Two of each hand per set, rated at 12.5t WLL per lug. Container lifting lugs are manufactured in our closed die forging process, so our customers can get the safest high quality lug available. 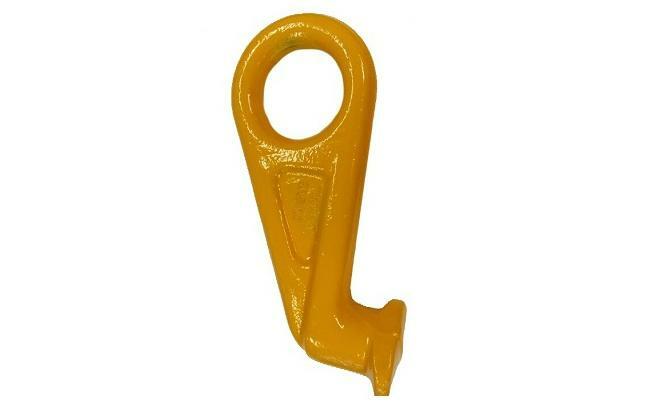 Why Forging for Container Lifting Lugs? Forging is one kind of metal working process that forms final shape by pressing solid bars under high pressure. Different from casting process, the materials applied in forging are mainly forged steel, forged aluminum, forged brass, ect. Among them, forged steel is the most popular material type for its low cost. Similar to investment casting components, closed die forging can also be used to manufacture many small metal components for industries like mining, agriculture, forestry, oilfield, ect. By comparision, this forging method shows better working performace. Container Lifting Lugs are closed die forged by special alloy steel with high intensity and high toughness, and then it is quenched and tempered for better performance. Surface treatment could be powder coated, mostly in yellow or red colors. 1) Forging will improve the internal organization and improve the mechanical properties of container lifting lugs. 2) Closed die forging can make net shaped container lifting lugs, thus will greatly reduce material waste and machining cost. 3) For the large demand of container lifting lugs, forging is the ideal production method for both sample and lots produdction. Fly Forge, one of the few top leading steel forging factories in China, can deal with all types of Forged Container Lifting Lug as well as other Shipping Container Fittings (including Container door hinge, Door Handle, Container Cam & Cam Keeper, ect.). Any need in such forgings, pls feel free to contact us. We are pleased to start our first cooperation from a trial sample order.